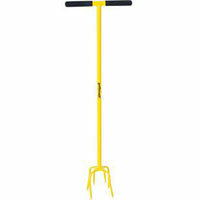 Garden tillers are available in today's market, from a wide range of manufacturers. Depending on how many bells and whistles you want on your tiller, you can find them as cheap as $100, or as much as several hundred. How do you really know which one will work best you though? We've done some research on the subject and have broken down the key points for you. Bigger is Better! : Now there are those of you who will see that statement and immediately scoff, but I will stand behind that one. I am a tool fanatic and usually buy tools for any job I come across. One thing that has proven true time and time again is bigger is usually better! The same is true for small garden tillers. I can't remember the last time I bought a tool that had far more power than I thought I needed, and was disappointed with the results. The fact is if you have the extra power, you are going to put it to use and you are going to be thankful that you have it, it's just that simple. So as you start exploring the different options and manufacturers of garden tillers, don't immediately dismiss the ones that cost a little more. As technology becomes more and more advanced, manufacturers can produce better and better tools. Electric motors and tools have come a long way over the years, but they still cannot compare to the power of a gas powered engine. Now I'm not diss'ing electric tools, I'll be the first to admit that I own a Worx GT electric weed trimmer and I love that little tool. But like any electric tool, it has its limitations and I've learned what those are and have come to appreciate the tool for what it excels at. There are some things that my electric trimmer just wasn't made to do that a gas powered one could. You need to be realistic about what you are buying and how you are using it. I also owned an electric garden tiller that I used to run an extension cord to the garden for. It had several different attachments for different jobs and it was a fine little tool. I will be honest however; it lacked the torque to really take on a NEW garden project. It did however do just fine tilling existing gardens year after year. This is going to be one of the first questions you have to address when shopping for small garden tillers…do you go with a cheaper electric unit, or do you spend the extra money on a gas powered machine. My suggestion, if you have the budget for it, is to go bigger than what you think you'll need. It's always better to have more power than you need, rather than get into a project and find out that you don't have enough. If you have small gardens and are not expecting to work on larger plots of land, electric garden tillers will generally work for you just fine. If you think you will have the need to do larger gardens, you may want to consider investing the money in a larger gas powered tiller. It may cost you more up front, but in the long run you will most likely appreciate the bigger machine and the added capability. 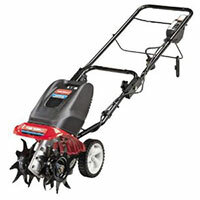 4-Stroke vs. 2-Stroke: So let's assume that you've looked around and decided to go with one of the gas powered small garden tillers. Now you have to decide if you want a 2 stroke or a 4 stroke model. A lot of people ask which is better and the truth of the matter is, it depends on what you are using the tool for…and who you ask! Let's look over some of the pros and cons of each…. 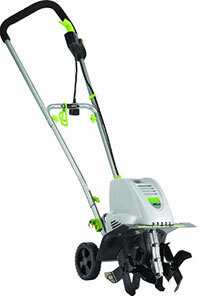 2 stroke garden tillers have a number of advantages over their 4 stroke counterparts, especially in the lawn care field. One of the biggest advantages is 2 stroke engines have only 3 major moving parts, the piston, the crankshaft, and the connecting rod. The smaller 2 stroke engines do not use valves, lifters, or cams. Generally speaking, the fewer the moving parts an engine has, the less potential there is for a failure and the easier the engine is to maintain. This gives 2 stroke engines a pretty big advantage over the long haul. 2 stroke engines are also lighter and easier starting than 4 strokes, which is nice for smaller gardeners who want a more manageable tool. Now on the performance side of the equation, 4 stroke engines rule! 4 stroke engines have a much better fuel economy, they don't burn their oil so the emissions are much better, and 2 stroke engines have less torque potential than their 4 stroke counterparts. 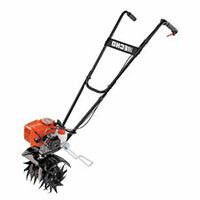 If you have a big garden and you want something that truly has some power, you're going to want to look into small garden tillers that have 4 stroke engines so you can really get the power you need to turn the toughest soil. Attachments: The last thing I'll make mention of in this article is potential attachments for whatever tool you end up buying. I don't know what your shed looks like, but mine is always jam packed with tools of every kind. Granted this is a self-inflicted problem, but it does illustrate the value of tools that have multiple functions. 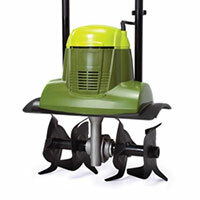 There are small garden tillers out there that have removable heads on them that you can then fit a multitude of other lawn care tools such as edgers, trimmers, blowers, etc. Instead of having to shell out a a lot of money up front for the entire set, you purchase only the tools you need at the time and you have the ability to expand on the set later. If you can find garden tillers that can also be used as a weed trimmer or edger, they will more than pay for themselves in the long run!